E.J. 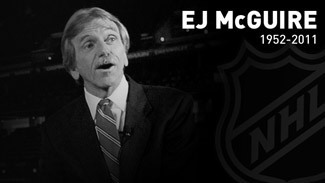 McGuire, the respected Vice President of NHL's Central Scouting, died Thursday after a five-month battle with cancer. McGuire, 58, was the architect of many of the innovations Central Scouting pioneered in the past decade to achieve its mandate of providing the League's clubs with the most comprehensive list of NHL Entry Draft-eligible prospects each season. Diagnosed this past December with Leiomyoscarcoma, an incurable, rare form of cancer that aggressively attacks the cells that make up the involuntary muscles within the body, McGuire waged a brave five-month battle with the disease. He is survived by his wife, Terry, and their two children, Jacqueline and Erin. McGuire's legacy to not only scouting -- but hockey as a whole -- is almost unrivaled. While he came to prominence as the Director of Central Scouting and the League's public authority on each year's draft class, McGuire spent his adult life in ice rinks across the globe as both a coach and scout. As the head of Central Scouting, McGuire was responsible for coordinating a staff of 29 scouts that spent each season watching and rating that season's draft-eligible prospects. Those reports were then formed into the Central Scouting's Final Rankings, which served as a valuable resource for the League's teams at the Entry Draft. "What the Central Scouting does is provide a subjective opinion on who our scouts feel should be drafted and in what order," McGuire told NHL.com last June. "Our directive at Central Scouting is to put together four lists, a ranking of North American skaters, European or international skaters, and then separate rankings for goalies. So we put out those four rankings and then let the teams mesh them together for their big list." McGuire began his hockey career as the head coach of SUNY-Brockport, his alma mater, in 1977. It proved to be a journey that took him through most of the major hockey leagues in North America before he settled with Central Scouting. McGuire began his career at Central Scouting shortly after his last coaching position as an assistant with the Philadelphia Flyers in 2001-02. He was an assistant in the NHL with the Flyers from 1984-88 and the Chicago Blackhawks from 1988-91. He was coach of the Maine Mariners of the American Hockey League in 1991-92, then returned to the NHL with the Ottawa Senators in 1992-93 before taking his second coaching position with the Ontario Hockey League's Guelph Storm in 1995-96. McGuire moved back into professional hockey in 1997 as coach of the AHL's Hartford Wolf Pack and, after two playoff appearances in two years, returned to Philadelphia for one more season before moving on to scouting. It was scouting that proved to be the best fit for McGuire, who had the perfect demeanor and skill set for the demanding job of evaluating young players and projecting their hockey development several years down the road. His love of his profession was on evidence each time he spoke about an upcoming Entry Draft or any of the hundreds of prospects that passed under his watchful eye each season. The enthusiasm he held for his responsibility permeated his discussions about scouting in general and, specifically, the mandate of Central Scouting. NHL Central Scouting, which is in its 36th season, was established prior to 1975-76. The department consists of staff at NHL offices in Toronto, along with eight full time scouts, and 15 part-time scouts throughout North America. To report on prospects playing in Europe, the NHL employs the services of Goran Stubb and his staff of six scouts at European Scouting Services based in Finland. Together, all 29 scouts reporting to Central Scouting and McGuire combined to witness approximately 3,000 games during the 2010-11 season. Central Scouting is holding its annual Final Rankings meetings this week in Toronto to determine who will be the top-rated prospect for the 2011 Entry Draft, which will be held this June in St. Paul, Minn.
"First-round picks underachieve, late-round picks can only overachieve -- because of expectations," McGuire told NHL.com back in 2008. "We hope we're helping the NHL teams, who are selling the fact that their first-round pick will be someone who, in three short years, could be scoring two goals in Game 3 of the Stanley Cup Final before a full house on a team that was up for sale only a few years ago (2006) ... Yes, I'm referring to Sidney Crosby. Can it be significant? Just turn on your TV to find out."